After the storm: Where should the USS dispute go next? The Higher Education Policy Institute has published a new analysis of the biggest university pension scheme, the Universities Superannuation Scheme (USS). The USS: How did it come to this? (HEPI Report 115) by Nick Hillman considers the history of the Scheme, from before it began in 1975 to the recent lengthy industrial dispute. The USS had modest beginnings, with plans for 20 staff, a CEO on £7,500 a year and no computers. Now, it is the largest private pension fund in the UK and one of the top 50 in the world, with over £60 billion of assets and 420,000 members from more than 350 institutions. Its portfolio includes Moto motorway service stations, the Grand Arcade shopping centre in Cambridge and Brisbane Airtrain. It has around 500 staff, with 128 on six-figure salaries. From the start, the main trades union (originally the AUT, now the UCU) has had a formal role in setting the rules and has often proved prescient, although most of the risks have been carried by universities (and taxpayers). In the first 36 years of the USS, employees’ contributions rose by just 0.10% (to 6.35% of salary in 1982). Meanwhile, employers’ contributions fluctuated between 12.00% and 18.55%. Today, the contributions are 8.00% for employees and 18.00% for employers, though both are due to rise in April 2019. The USS has worked well for post-war babyboomers. An academic born in 1950 was settling down in their career when the USS began in 1975 and entered retirement with a generous pension aged 65 in 2015, just a year before the first big reductions in pensions for existing staff. The recent strike over the USS arose, in large part, from a failure to learn from past successful pension reforms. These have been shown to depend upon: independent oversight; broad consultation; openness; sufficient time; effective leadership; and managing trade-offs. Recent discussions have become bogged down in important technical discussions over how to value a pension scheme, while the bigger picture – such as the relationship between pay and pensions – has been lost from view. 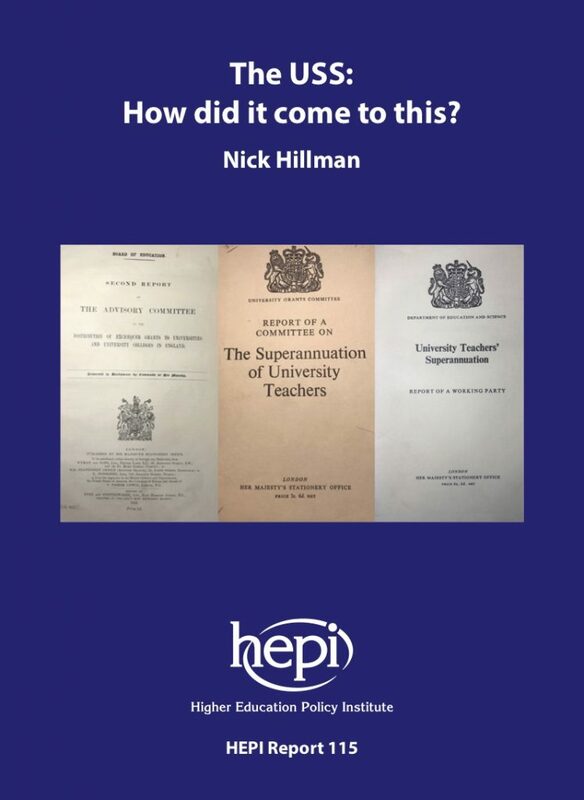 Nick Hillman, Director of HEPI and the author of the report, previously worked on pensions at the Association of British Insurers and was a member of the Joint Working Group, which advised the Government on workplace pensions. The great 2018 university pensions dispute was deeply unsettling and the scars are still painful. The University and College Union’s members ran a successful digital campaign and the universities were left playing catch up. The embers of the dispute are still smouldering and they could flare up again at any time. If the episode is to be more than a disaster with a legacy of tension, then it must also be an opportunity to plan a more sensible way ahead. The underlying challenges faced by the USS are old ones but, in the past, they were masked as there was a deeper sense of a single higher education system, looser regulation of pensions and higher investment returns. The question is what to do now. Three avenues are likely to prove most fruitful. First, considering whether to stop treating the USS as a one-size-fits-all scheme, given different employers have different outlooks. Secondly, because pension contributions are deferred salary, bringing the higher education sector’s pay and pension negotiations closer together. Thirdly, accepting both sides need to give as well as take. Good pensions are built by good employers. Despite the recent turmoil, we should not lose sight of the deep commitment by universities, over many decades, to ensure their staff have secure retirement incomes. The USS would not exist without their long-standing support. In the heat of a strike, it can be easy to forget your opponents may be well intentioned too.